Know someone suffering from an old injury? Fibromyalgia? Chronic pain? Did you know Physiotherapy can make a difference in the well being of people suffering chronic pains? Our physiotherapist will use a variety of approaches, some at the same time, some in progression as a person shows improvements. 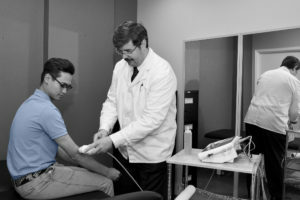 Modalities such as electrical stimulation, ultrasound and trigger point work. The Brain that Heals Itself and The Brain’s Way of Healing by Norman Doidge, also available on Amazon; at least one of the books is available on SCRIBD as audiobook.